When a new season begins, I always find myself inspired to make changes to my everyday routines - whether that means streamlining things, or beginning new rituals - it is the ideal time to start fresh. Not to mention, after buying my first home this summer and with a busier-than-ever work schedule, I've been feeling like I'm burning the wick at both ends. So, I took the start of fall as an opportunity to edit my life a bit, thus making time for more self-care. Here are the three major changes I've made in an effort to feel refreshed, healthier and less stressed so that I can enjoy the upcoming cozy month's and holidays without feeling burnt out. Who else is guilty of letting their eating and exercising habits slide a bit when their busy? *Raises hand* Overall, I tend to eat healthy, and because I'm someone whose body just requires me to do so, I can really feel a difference if I slip off the bandwagon. And by that, I mean that I feel it physically, but also mentally; I'm even more tired, don't feel as good in my clothes, and my skin doesn't feel its best. Over the past few weeks, I've been making a effort to be better, both at exercising and eating healthy. I've found that just small adjustments make doing this so much easier; for example, preparing meals ahead of time, or even just planning out what I'll make for each meal, really helps me to stick to my plans versus making something quick and unhealthy. In turn, this helps me to free up time to exercise and get more active - even when I'm too tired for intense cardio, I'll make sure I get out and walk. I've regained energy and feel so much better already. Eating healthy is only a part of taking care of my body; I'm talking inside and out! I'll admit I'm the first to let my skincare routine slide during the summer months when it comes to body, simply because I want to spend every last drop of my free time out in the sunshine while I can. However, when the temperatures drop, so does the humidity, leading to dry skin that simply can't be ignored any longer. 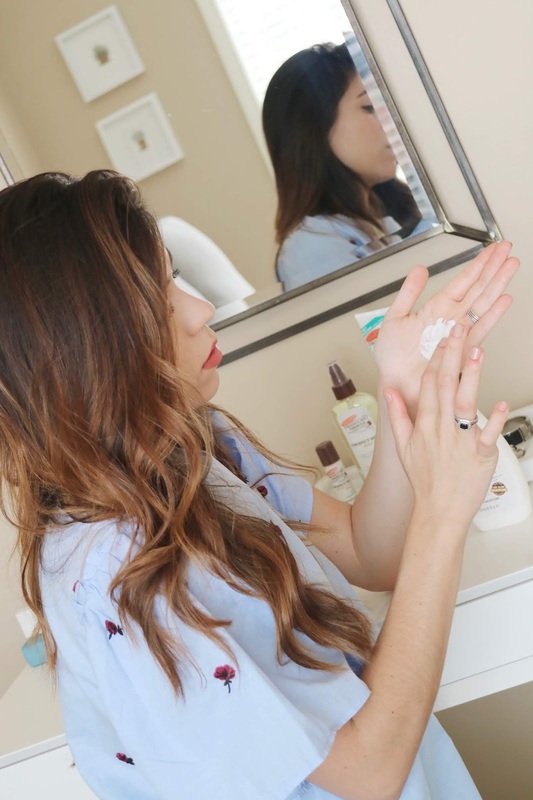 In an effort to prevent my skin from losing precious moisture, I've decided to be proactive about my body care and diligent about my routine so that I experience less seasonal irritation as the temps continue to get even cooler. 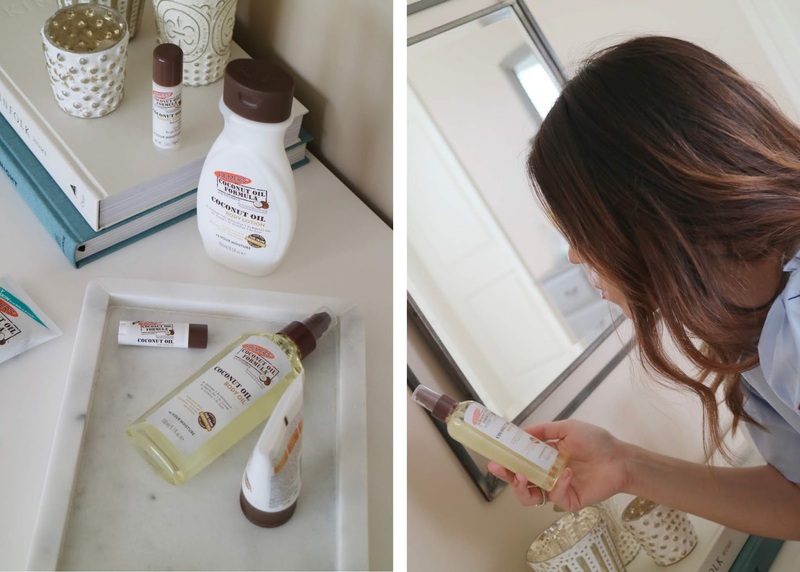 Palmer's recently launched a body care line with Coconut Oil as the star ingredient, and because it's super moisturizing, while also managing to be fast-absorbing and non-greasy, it makes my routine an effective and speedy one. 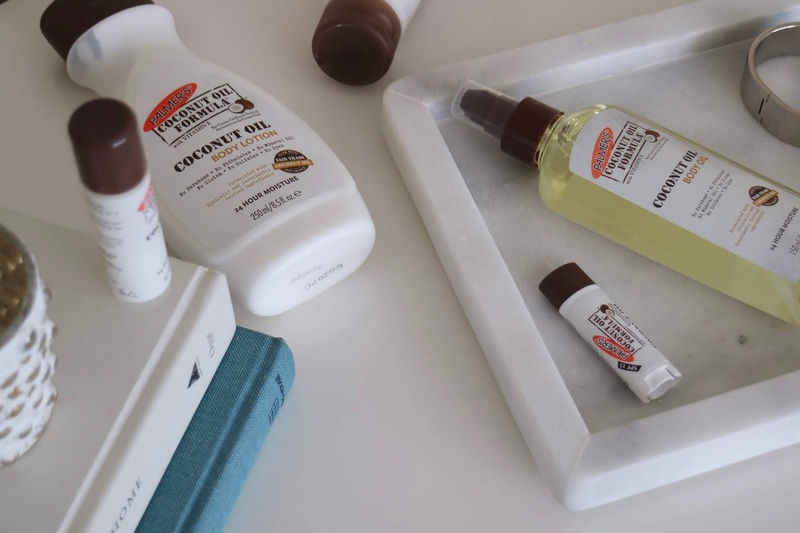 The range features four products perfect for nourishing the skin this season (and thanks to its non-greasy nature, year-round too) and includes a Coconut Oil Formula Body Lotion, Body Cream, Body Oil and Hand Cream. 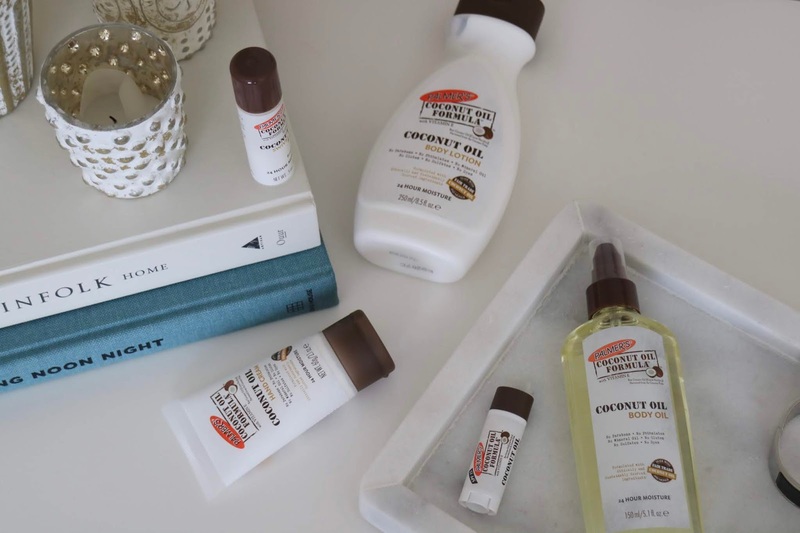 I love how healthy and radiant these make my skin feel, but I also really appreciate that all of the Coconut Oil Formula products are free of parabens, mineral oil, sulfates, phthalates, GMOs and harsh chemicals. 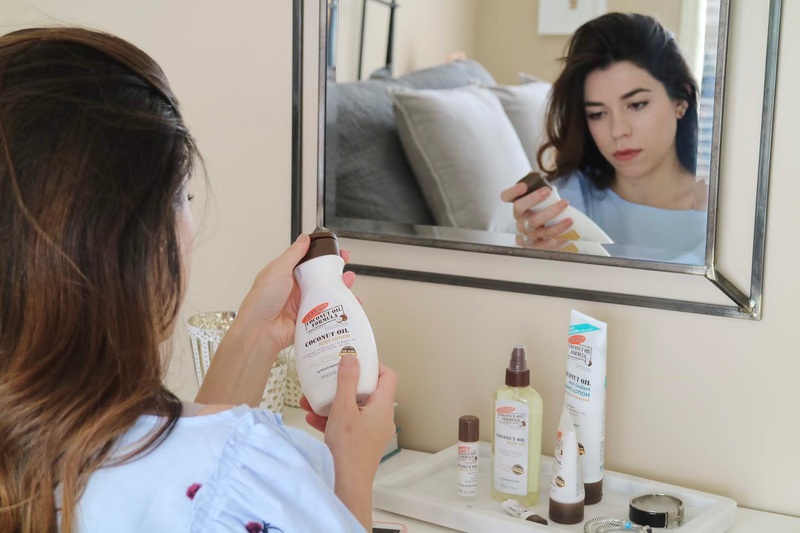 And, being someone with sensitive skin, I'm thrilled to have found an affordable body care line that's non-comedogenic, dermatologist tested, hypoallergenic, and made with fair trade ingredients. I swear that this is no small feat! The two products I've been using non-stop from the range are the Coconut Oil Formula Body Lotion and the Coconut Oil Formula Body Oil. I love the Body Lotion, as it contains rich, skin-conditioning coconut oil and coconut milk that infuse the skin with deeply penetrating moisture and an instant hydration boost. The Body Oil, on the other hand, actually contains raw Coconut Oil alongside a blend of other natural oils - including Grape Seed, Argan, and Macadamia - to deeply penetrate and rehydrate skin on contact. I love applying this product right out of the shower to prevent that awful tight and dry feeling so many of us experience during the winter months! When I moved a few months back it was difficult to find the perfect place for all of my things right off the bat, but, after months of living here, I can finally get a sense for the space and tell what should go where. I also have come to realize the areas of my life that are in need of a serious declutter...read: my closet. When things get out of hand and I accumulate too much of any one type of item, I find it difficult to choose anything to wear. So, a few weeks back I tackled the massive project that is going through every bit of clothing I own, and I can't tell you what a difference it's made in my routine. Not only am I able to find items that were buried within stacks before, I now use more of what's left because I only kept what I truly like. My next task will be a beauty product sort-through...wish me luck! What changes do you make each season to help prepare for the coming months? * I participated in this sponsored campaign for Palmer's® on behalf of One2One Network. All opinions stated are my own.